Registration is $20 and ends at noon the day of the event, or $15 prior to October 30th. In addition to the show there will be a costume contest, candy, and raffle drawings throughout the day. 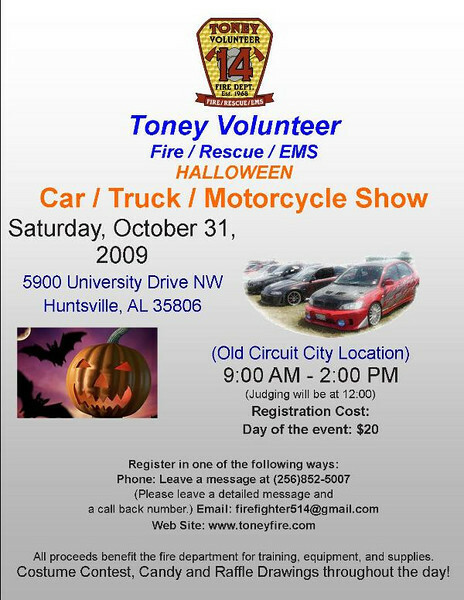 All proceeds benefit the fire department for training, equipment, and supplies, so come out and show for a good cause. Even though the weather cleared from the early morning threat of rain, it had already damped the spirits of most would-be attendees. Third time was kinda a charm with no rain, but there was nowhere near the turnout needed to raise funds for the equipment these guys need. 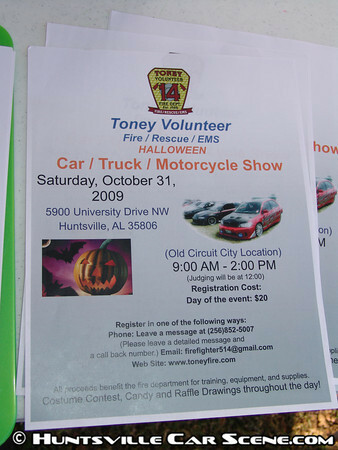 Take time to check out www.toneyfire.com and see what is being done by volunteers for the community who risk their life. They will have another show in the spring, so watch for it and support their cause. I was wondering if they were going to do this show since they got rained out on every attempt. Glad to see they stuck with it! Shhhh! Don't jinx it! There's only a 20% chance right now, but I think it will go away as long as it rains during the week. Well its time to go fishing. It's suppose to be 70* and sunny saturday. I'm getting "Showers likely and isolated thunderstorms. Highs in the upper 60s. Chance of rain 70 percent." for Saturday. It's even spilling over to Sat night, where before it was clear. well dang.. I check last night and the thing I looked at said Rainy/ Storms Thursday and Friday and then Sunny Saturday and Sunday. I hope its cleared up by atleast Saturday night. Did you get my text? Yeah, I'm bummed out too. I wanted to get out again this weekend. I didn't get the text. My phone has been rebooting randomly when receiving or sending texts. I think I've overloaded it. Just call me whenever you get a chance, 615-512-5520. Last edited by Samir; October 28th at 09:21 AM. well if it does rain i should be able to catch and split open a piece of fish. The rain is supposed to be ending shortly. Come on out! Yea I'm cleaning out my car now. It did. The weather was a bit overcast, but was rain-free. I don't think anyone got out today. It just started with rough weather. I talked to them about the event and they plan to do something in spring. I never realized the level of dedication what they do takes. I personally sacrifice to make this web site and I hate it at times, but these guys put their life on the line for someone else and they all have regular day jobs. Can you imagine that? You're an on-call firefighter and have a full time regular job? 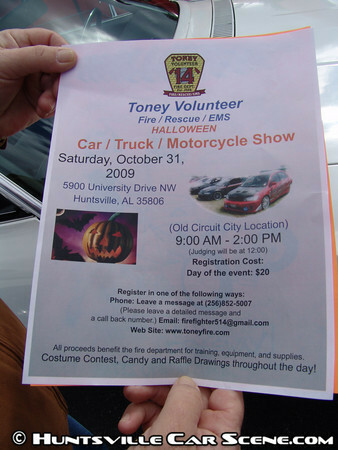 Oh, and you're a volunteer department, so you have to fund yourself too. These guys need the support, and I'm happy to help them with their cause.